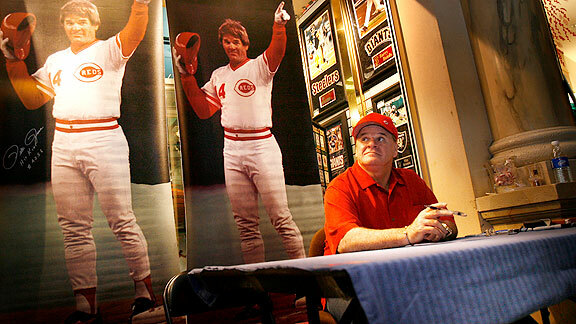 AP Photo/Isaac Brekken Pete Rose has taken a dramatic path from Charlie Hustle to Hit King to relative obscurity. LAS VEGAS -- Sleep well, LeBron James. Don't worry, Tiger Woods. The bad news? You're both currently objects of public derision -- besieged by nosy European golf writers, targeted by Dan Gilbert's comic sans missives. The good news? In a couple of decades, you'll be just fine. Because no one is going to care. Remember Charlie Hustle? The hit king pariah? The man who bet on baseball, sinned against the game, denied and stonewalled and eventually came kinda sorta clean, spurring countless columns and endless articles and umpteen hours of sports talk radio Hall of Fame debate? He seemed to matter once, too. Not anymore. Not Thursday, at least, when I spotted Rose signing autographs at a sports memorabilia store inside the shopping mall at Caesar's Palace. Under a phony indoor sky, beside a television screen listing his career statistics in comic sans font -- really -- Rose sat at a table, waiting for a lunchtime crowd that never materialized. A few gawkers came and went, snapping pictures on their smart phones. An occasional person paid for Rose's signature. Mostly, though, Rose was alone, eating diced fruit with a plastic fork from a tupperware container, making chit-chat with a handler wearing a backward Cincinnati Reds warmup shirt. A woman dressed in black -- Rose's publicist, perhaps? -- spent more time wandering the mall then pointlessly hovering. What struck me about the whole scene wasn't the indignity of it all. Rose needs to make a buck; also, he's Pete Rose. No, what resonated was his matter-of-fact irrelevance, less sad than inevitable, the way of all celebrity. Nearby, a crowd gathered around the mall's "Fountain of the Gods," transfixed by animatronic Roman deities that were one part Talking Presidents, one part Chuck E. Cheese. The fountain had its own security guard, an old, cranky man warning spectators to keep their distance. As for Rose? You could get as close as you wanted.